There aren’t many events left that capture the attention of pretty well everyone. For the golfing world, a certain April Sunday in Augusta is a sacred day – but the Super Bowl grabs the attention of everyone. The most expensive TV Commercials of the year. The busiest day of the year in the pizza delivery business. And of course, half time shows that have become quite the topic on social media. Oh, and a football game to boot. 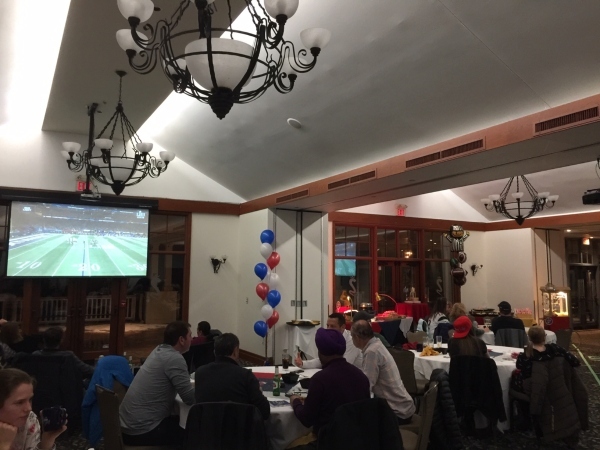 The amazing staff at RattleSnake Point didn’t want to miss out on the celebration and the Members and guests who attended were luckier for it. Although two RattleSnake Members ended up the luckiest, as they each won entry into upcoming ClubLink trips. First up is the ClubLink Punta Cana Championship, just six weeks away. The second trip is the for the 2019 edition of the annual Men’s Night in Las Vegas, held each November. This is the kick-off of our new Punta Cana trip and it’s lovely to have the Caribbean back in the mix for your consideration. There is still room for a couple last minute additions and if you’d like to learn more, contact Jeff Knuth at Merit Travel. But for all those remaining attendees who don’t have to clear their calendar in late March or next November, the day was a treat nonetheless. To add some pizzazz to the low scoring game, Chef Mark Stone put on a delicious game day spread that kept our guests heading back for more. The entire staff worked to get the Clubhouse into a football feel right down to a 50 yard line dissecting the floor. 2019 is certainly setting some new events in motion, as the Big Game party at RattleSnake and the ClubLink Punta Cana Championship coming up in six weeks are a nice start to the new year. For more information on the ClubLink Punta Cana Championship, see the next article in this edition of ClubLink Life Weekly.